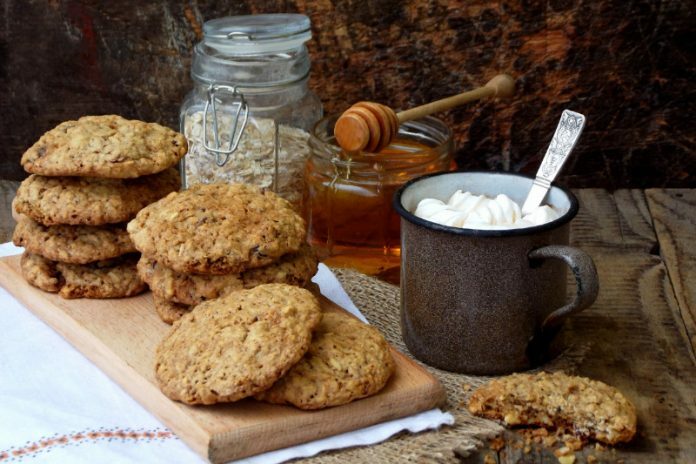 These peanut butter oatmeal cookies are the perfect way to celebrate National Peanut Butter Cookie Day. Chewy, nutty, and packed with peanut butter flavor, you’ll find these cookies absolutely irresistible. Both peanut butter and oats are healthy ingredients to use in baking, plus they taste great, as demonstrated with this recipe. Other healthy ingredients include coconut oil, honey, and wheat flour – all cleaner substitutes for ingredients like butter, table sugar, and white flour. We love how these peanut butter oatmeal cookies have a crisp exterior and chewy center. The key to getting cookies that don’t spread too much in the oven is using the proper ratio of fat (in this case coconut oil) to other ingredients in the dough, and briefly chilling the dough prior to baking. As tantalizing as these healthy cookies are, this recipe yields more cookies than we can usually finish before the cookies go bad. As a result, we like to shape the extra cookie dough into balls and then freeze them to be baked later whenever the craving for them strikes. If you plan on baking the entire batch of peanut butter oatmeal cookies, make sure to store the leftover cookies in an airtight container. They should be good for another three to four days. Preheat the oven to 350°F. Line a baking sheet with a sheet of parchment paper or a silicone mat. In a large bowl, cream the coconut oil and brown sugar together using an electric beater or a rubber spatula. Add the honey, egg, and vanilla extract. Stir to combine well. Stir in the peanut butter and mix well. Add the flour, baking soda, and salt. Mix to combine well. Stir in the old-fashioned oats until incorporated throughout the dough. Use a medium cookie scooper to create 12 cookie dough balls and place them on your baking sheet. Place the baking sheet in the freezer for 5 minutes to chill the dough. Bake for 12-14 minutes, then remove from the oven and let the cookies cool on the baking sheet for a few more minutes.